Good Girl Gone Redneck: The Laurie Berkner Band Visits the Triangle! The Laurie Berkner Band Visits the Triangle! If you're a parent anywhere you have to know who Laurie Berkner is. And if you don't? I'm going to introduce you right now. Watch. Laurie and her band are a fantastic group geared towards entertaining little ones to the point beyond glee! And the tunes stick in your head to the point that you're probably going to be mad at me later when you've been singing it for about five hours. The Laurie Berkner Band is made up of Laurie (obviously! ), Susie Lampert, Brady Rymer and Bobby Golden. Back in 2009 I wrote about how Laurie was my new best friend. And people? I meant it. She was awesome. It's true that my daughter is eight (TODAY!). And it's true that we don't quite listen to Laurie anymore. But I've been a fan of her and her talents since then. Such a fan, in fact, that I've been getting updates in email about her coming to Raleigh (NC) for like five years. Literally. I could probably show you a few of them - but I think you'll believe me. I was a part of the campaign, signature and all, that expressed wanting her to come here. And now - because of my feelings about how she's good, clean, family and kid fun - I'm THRILLED to be able to offer you a family 4-pack of tickets to see her perform this month!! The Laurie Berkner Band will be performing at the Duke Energy Center in Raleigh on February 28th, 2015. The show takes place at 11 AM (doors open at 10:30 and the show will run for a little over an hour). For your own tickets you can head over to Ticketmaster, but you can also enter to win a set here. Laurie Berkner is a former preschool teacher who has been making music for over ten years. The first artist to appear in music videos on Nick Jr., Laurie and the Band were featured on almost every episode of Jack's Big Music Show! You can currently find her on Sing It, Laurie! on the Sprout preschool channel. 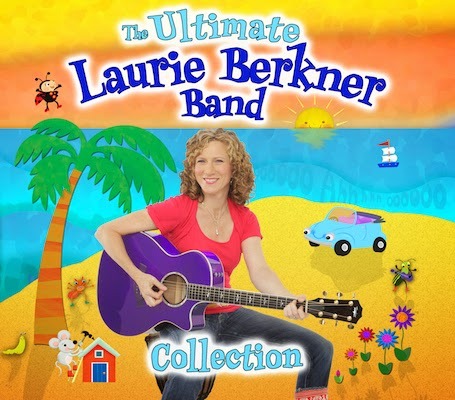 She's got loads of CDs out for your family to dance to and her latest, The Ultimate Laurie Berkner Band Collection, is available for only 9.99! And her Lullaby CD has over 20 songs and is the perfect way for your kiddo to wind down at the end of the day. Honestly, though? Rocket Ship Run is my favorite. Sssh. If you've got little ones you're going to want to enter this giveaway - simply for the free day of entertainment that they'll absolutely enjoy - and love you for! Did I mention it's free if you win? * I have received a set of tickets to this event to give away to one of my readers. I was not compensated for this post and all expressed opinions are completely my own. Seriously - go check my 2009 post. I'm a fan! Our family LOVES Laurie Berkner! Our favorite song is from the Rocketship Run CD: 5 Days Old. OMG..my kids love Laurie Berkner! Our favorite (right now) is Moon, Moon, Moon. We love the Laurie Berkner Band!! The Goldfish song is probably our favorite...it just cracks us up! Laurie Berkner has been a favorite in our house for many years...first with our daughter, who is now 6 and our 3.5 year old. They would love to go sing along with Laurie for a morning. My boys love Laurie... I think Victor Vito is probably their favorite. We actually played a Laurie Berkner Song at our weddng - My family. It just fit since it was my husbands second marriage and he was gaining a wife and step daughter. Always liked the line from the song," When your in my heart, your in my family." it was very fitting for our situation. I am a fan, too. Moon. Moon Moon. click. My kids started listening to Laurie Berkner in preschool and they still love her. Their favorite song at the moment is Walk Along The River, but it changes often! My 4 year old loves her. Balance Beam is a favorite right now.